Jason Atherton is spreading his wings. Not content with being appointed food ambassador for the UK by prime minister David Cameron, he’s opened City Social in what was Gary Rhodes 24th floor restaurant in Tower 42. British ingredients are the main attractions, given a thoroughly modern twist by the current master. The décor is Art Deco style, albeit in a modern steel and glass block. There are rosewood paneled walls, chrome and mirrors and smoked glass with a black-steel kitchen in the center of the room. You won’t know whether to look at the chefs or at the City view. Mon.-Sat. noon-2.45pm & 6-10.30pm. 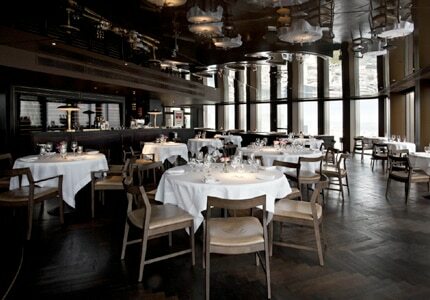 City Social, 25 Old Broad St., 24th Floor, Tower 42, London EC2N 1HQ, 020-7877 7703. Craft beers are all the rage in London, with microbreweries and pubs devoted to the new golden nectar springing up like mushrooms after the rain. Now The Craft Beer Co. has found a site in High Holborn on the edges of Covent Garden to add to its pubs in Clapham, Clerkenwell, Brixton, Islington and Brighton. Beer from Britain, Scandinavia and America is the name of the game. The Craft Beer Co. Covent Garden, 168 High Holborn, London WC1V 7AA, no phone.